We’ll be on Oprah’s Show again on Tuesday (Nov. 23) – if you wish to watch! She could not have been more happy to see us! God is touching her heart, it certainly appears!! She even mentioned her rosary which the Sisters gave her last time….no idea whether that will make it through the editors! Please spread the word and beg God to be able to use our efforts for His greater glory! Go here for the Pope’s answer and more — the full context of his answer which L’Osservatore Romano failed to provide! 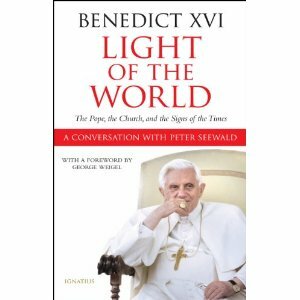 This week, Light of the World, a book-length interview given by Pope Benedict XVI to journalist Peter Seewald, will be released worldwide. Several of the Holy Father’s statements have already started making news, particularly his comments regarding condom usage in the prevention of the spread of HIV. For the rest of Janet Smith’s article go here. Janet Smith’s Interview in Zenit.org here. Especially Good: Jimmy Akin’s comments here. National Catholic Registers good article here.